So a bunch of the Home Right brand ambassadors where challenged to create something out of a Lowes ClosetMaid 6 Expresso Laminate Storage Cubes, Valspar Chalky Finish Paint, and the Home Right Paint Sprayer. For those of you who don’t know, you can actually use chalk paint in the Home Right Finish Max so putting the chalky finish paint into the Home Right paint sprayer is a-okay. You may remember the last Home Right hack with an IKEA bookshelf I did a few months back. I turned an IKEA bookshelf into a small dresser for my studio, and I won! Thank you for voting! I now have a new challenge. My son has been asking me to bring his 80’s Parquet Transformed Lego table up to his bedroom. Unfortunately, his room in our new house is smaller than his other room in Indiana. So we have kept the table in the playroom. I thought using this shelf would be a great option for him to have some of his Legos up in his room. I hope I don’t regret that decision. I mean, one can only take so many Lego messes in one house. 1. So I started out building drawers out of 3/4” plywood scraps. You can see the drawer making process here. While they look like drawers they function more like baskets since you can remove them completely. 2. I used the Valspar chalky finish paint in the color Kid Gloves in the Home Right Finish Max as a basecoat for the drawer fronts. 3. Once dry I gave the drawer fronts several light coats of spray paint. 4. I wanted to raise the shelf up a little bit. I didn’t want the expense of legs so I just used 2×4’s. I glued and clamped them together and once dry I ran them through my table saw and cut each side to 2.5”. 8. Once sanded I used pre-wood conditioner and some Java stain on them to match the shelf. 5. I just used Gorilla Glue construction adhesive to adhere them to the bottom of the shelf. I added two supports in the middle as well since the bookshelf is made of thin particle board. 10. I purchased two sets of knock-off Lego baseplates from Amazon and cut them with my table saw to size. I used the leftover pieces to piece in on the sides as well. I sanded the cut edge smooth. I used the construction adhesive to glue those to the top as well. 6.. I added weights for one hour to let the glue set. 7. I cut some Lego baseplates from to make some custom Lego knobs. They were thinner than the knock off baseplates I purchased. These baseplates were leftover from my other Lego table transformation. I sanded them smooth. 5. 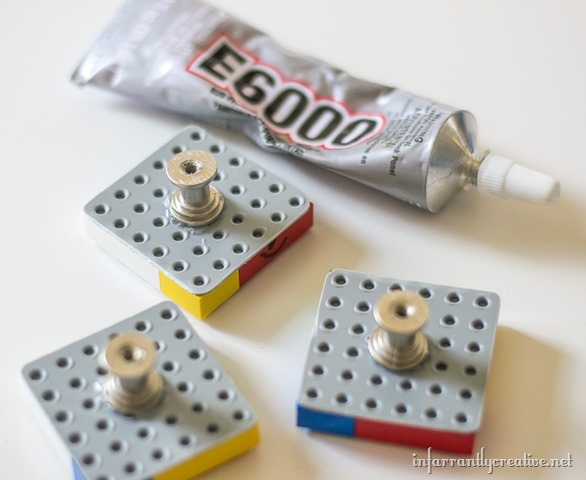 I used E6000 adhesive to glue to baseplates to the DIY bases from D. Lawless Hardware. I let them dry overnight. 6. Next I drilled holes into the drawers fronts and through the drawers. Then I screwed my knobs in place and added Legos to it. The Legos can be removed and switched out for a new design at any time. Lastly I just slid the drawers into place. You can slide the drawers out a bit to get out some Legos or pull the drawer entirely out like a basket to scour for that certain piece. Since it is less than 12” wide it is nice to push against a wall and have space to build. My Lego loving son is grateful to have a spot in his room to hang out and build. I swear Legos are such a universal toy. Boys, girls, young and old love to build. Just get my father-in-law in the room and he will attest to it.